Ginsu Hanaita Damscus Series cutlery is crafted from 33 layers of high carbon and low carbon Japanese Stainless Steel with VG-1 core to form a superior Japanese Damascus blade. The blade is sharpened to a razor sharp Asian knife edge angle of 10°, and then cryogenically cooled in our proprietary processs. This process utilizes liquid Nitrogen to draw the molecules of the steel closer together for ultimate edge retention, sharpness, and superior performance. Hanaita knives are designed with comfortable POM handles that offer the highest level of professional balance. The Ginsu Shinogi symbol which is artfully located in the center of each handle, and the Japanese Hanaita symbol displayed on the stainless steel end cap give each Hanaita knife a distinct look. 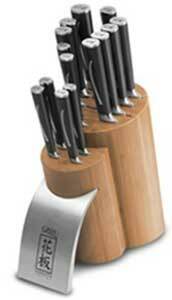 When not in use, the knives are stored in an incredibly strong and visually stunning, solid bamboo knife block. Each storage block is made of top quality, richly grained bamboo with a brushed metal stand for a unique, elegant Asian look.